I don't remember a time when I didn't know how to swim. We grew up in Arizona and always had a pool in our backyard, I barely remember a time where we used water wings as a swim aide. Water was never somewhere I felt uncomfortable, unsure or unsteady. I remember my sister's and I had the beautiful golden tan of children that play outside and the green hair of blonde kids that spend too much time in chlorinated water. My life as a swimmer eventually brought me to a swim team where I swam for a few years and then into High School where I lettered as a freshman for our swim team. I spent most of my time in a bathing suit. My love for water also was part of some of my first jobs when I decided to become a lifeguard in high school and the first year of college. What college girl wouldn't want to earn her party money by getting a tan outside? I taught swim lessons to little kids in water wings (floats) and it was one of my most favorite parts of working at the country club. I loved their excitement and how cute they were in their little bathing suits and their little hands holding onto the side. That was 18 years ago and it feels like yesterday. In the blink of an eye. 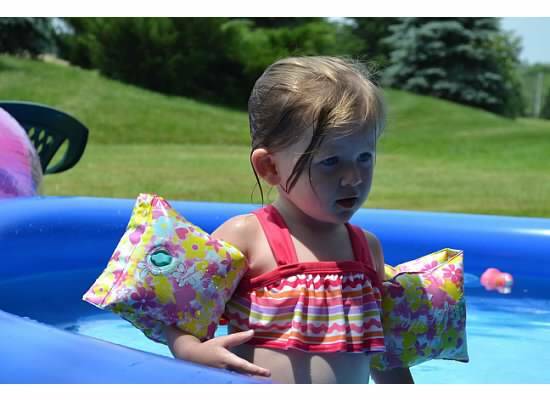 It is a different kind of summer, I am a mommy and my almost four year old daughter has inherited my love of the water. 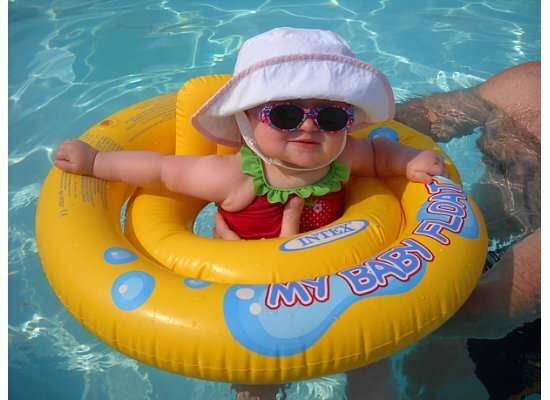 Even as a baby she loved to swim, each year she got older her love of the water increased. There is something magical that happens for me when I switch her into her swimsuit and cover her skin with sunscreen. Something about the way she smells while we our outside, her warm skin, and slightley damp bathing suite brings back the memories like a dream. I want her to remember the same things as I did when I was floating in the pool. When winter tosses its frozen blanket over our life for the long winters, I find my daughter playing in the sink and running around in her bathing suit. She pretend swims in the tub and has whole days that revolve around pretend swimming. Such is her love for the water, that no change in weather stops my darling girl from getting a little wet. This summer things are different and we don't have a pool in in our new neighborhood but we did buy the requisite hard plastic pool that we put on our deck so our little water bug can play. I realized this year that she has become more and more comfortable with the water and that for her, for us, for the utmost safety we have to get her some swim lessons. I believe in the safety that has to come around water. I know there have been too many innocent children who have accidentally drowned or were in a situation where saving themselves wasn't an option. I know that as careful as my soon to be four year old is around water that there is always the potential for danger. The time has come to teach her how to become an actual swimmer. Are group lessons the best option or would a one on one class be our best fit? Summer isn't just about fun, summer and splashing in the pool. Its about the look in my daughter's eye when she knows a sunny day is upon us and that we will be filling up her pool for playing. Until she can swim, even leaving her for a moment with her water wings on is out of the question. Water wings deflate, kids slip and fall below the water and those are the times when a parent would say.." I only turned my back for a minute". Her quite confidence in the water paired with her bravery for try new water tricks has motivated me. My youngest daughter didn't inherit my gene for water and rather hates it. Sister will only stand in the water or reach in from the outside of the pool. So tomorrow I will google for swim lessons, find a club, a teacher, a center or an indoor pool that my baby can learn to swim. I am equally excited and fearful for what comes with the independence of learning to swim. What age will you teach your child to swim and what options will you choose as your best path? Do you believe the love of water can be passed down? Share with me and as always, Thank you for stopping by! I loved taking swimming lessons when i was a preschooler as well as a little older. I've been seeing stuff recently about swimming with small infants and and intrigued but not sure what I'll do with my own kids. My friend was concerned that after her kids took swimming lessons without floaties, that since she allowed them to use floaties at a friend's pool after...that they might forget what they previously learned. What do you think? I would really like my son to learn how to swim this summer. I think so much of this comes with wanting them to be safe as well. Let me know if your little one learns to swim! I think it is important for all kids to learn how to swim. Great to get them in the water early! I started teaching swimming lessons when I was in high school as a lifeguard, so I take my kids to the pool often. I love introducing them to water safety! Im thinking about starting him this summer at 2 1/2 :) I think it will be great for him to just become acclimated with swimming and playing/watching other kids will definitely help!! I think the parents attitude can make a difference. My daughter was a polar bear when it came to swimming. No water too cold. And the parents have to be fanatic about safety. I don't know what it is, but when I make a mistake with my spelling and try to correct it, it will not let me. I have to refresh the page. This is the only site I have a problem with that, anyhow, I taught my girls how to swim with the wings. They are grown now, and it's time to teach the grandchildren. I'm working with my 3 year old on beginning swimming lessons. My mum taught me and I figure between me, her and his dad we can teach him ourselves :-) I really wish we had a pool though, I too remember those wonderful summers or childhood spent in the pool and green hair LOL! All my kids so far ahve taken after their mommy and are little water babies, which makes me happy. I loved taking and teaching swim lessons and was on the swim team in middle school. It's great to encourage a healthy understanding of the water! Your daughter is absolutely adorable in the first photo!! I wasn't ever a really good swimmer. I even remember the class my mom had me in that I was the "teacher clinger" bc I just didn't like it. My husband is much the same... but we have a cottage on the lake. And even with the shallow, very shallow water, I think learning to swim is such an important life lesson/milestone. So I think I will want to have my children learn earlier rather than later!